Drawing comedy from the technological divide that seems to separate the Millennial generation from the Gen X, Gen Y, and the Baby Boomer generations, CBS’ new comedy series offers THE GREAT INDOORS about a former outdoor adventure magazine that embraces the new digital era and goes completely online — much to the dismay of seasoned outdoor traveler and reporter Jack Gordon (Joel McHale). As Jack acclimates to his new work environment and his younger, more tech-savvy co-workers, the tension and confusion is eased by the humorous intersections between the represented generations. 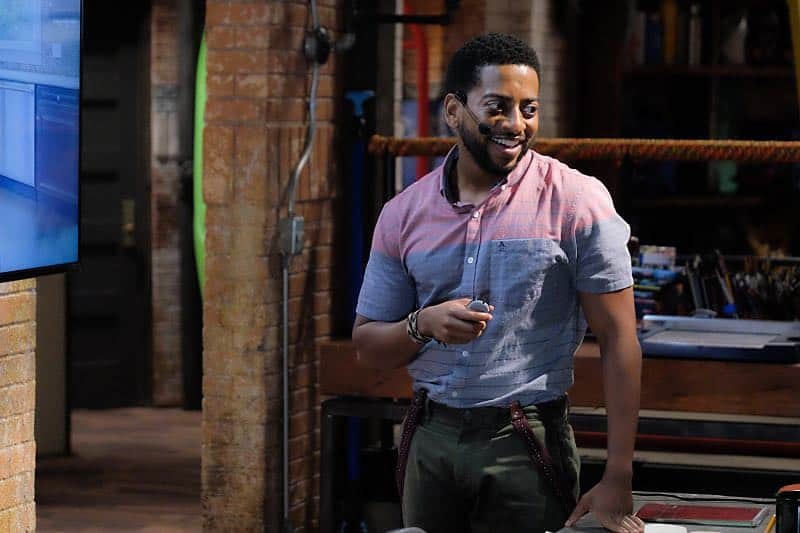 In an exclusive interview, co-star Shaun Brown shares what he has encountered so far in THE GREAT INDOORS, as well as previewing a few of his upcoming films. What drew you to the role of Mason and the show THE GREAT INDOORS? SHAUN: I have a lot of similarities to Mason. When I read the script for the first time, the role felt very honest and grounded to me. Every reaction and every joke I read in the script could’ve easily been said by me and not a “character” that I would have to put on. I felt like our similarities would create a very unique personality and not a regurgitation of something I saw another actor do. As for the show, I thought it was hilarious and very relevant. How would you describe who Mason is and how he relates to his coworkers at Outdoor Limits? SHAUN: Mason is the idea guy out of the coworkers. He helps put things in motion when the other coworkers are stumped on what to do to achieve their goals. He has a huge heart and is the tweedle dee to Clark’s (played by Christopher Mintz-Plasse) tweedle dum. What is it like working with Stephen Fry and Joel McHale? Is it a laugh-per-minute riot? Who is the one who keeps everyone laughing on set? SHAUN: Working with Stephen Fry and Joel McHale doesn’t feel like work at all! They are amazing talents and amazing people, so it just feels like we are having fun and playing everyday. Joel McHale is hands down the one who is keeping everyone laughing the entire rehearsal and taping process. He is incredibly quick witted and really keeps you on your toes with his jokes. 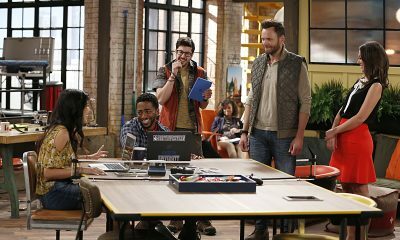 With the show drawing comedy from the differences between millennials and older workers, do you identify more with one group more than the other? SHAUN: I’m not ashamed to say that I am definitely a millennial. I’m obsessed with technology and I can definitely get lost in social media and the news outlets that are provided abundantly through the various apps on my phone. There are definitely things I identify with when it comes to the Gen-Xers but if I had to chose a side it would be millennial all day. What do you see to be the perks and draw backs of being in the millennial generation? SHAUN: I think being a millennial generation has some really great perks. First of all the work force has become extremely social media savvy. When it was first introduced, it was more of a way to connect to friends at other colleges (Facebook) or to say a short insightful/witty thing to put out to the world (Twitter). Now it has become a business tool, marketing tool, a place for memories and photos, etc. Its amazing that so many things rely on social media, and we the millennials were apart of it since inception, making us incredibly savvy and ahead of the curve. I also feel like we are a very inclusive generation when it comes to diversity, women’s rights, and LGBT rights. I would say the drawbacks are some of the things we talk about in the show. Being attached to our phones does create a disconnect to the “real world”. Also some of the social media can quickly be a gateway to narcissism in extreme cases. However all that being said, in my opinion, the perks outweigh the drawbacks. As an actor, what is fun for you working on the show? And what have you learned? SHAUN: I grew up doing theater and I studied theater in college. I lived in New York City and was a professional theater actor for two years before I moved to Los Angeles to pursue TV/ Film. Because THE GREAT INDOORS is taped in front of a live studio audience it feels like I’m doing a play every week. As an actor, there is a sense of creativity in that. I wouldn’t have the freedom I have on this show if I were to be doing a network procedural drama. The multi-cam sitcom style lets me play more which is incredibly fulfilling as an artist. Watching Joel McHale, Stephen Fry, and Christopher Mintz-Plasse week after week is a masterclass in trusting ones instincts. They are all creative masters who enjoy the process and are not afraid to fail. What has been the best advice you have gotten as an actor? SHAUN: I watched a Bryan Cranston interview once where he talked about auditioning and how as actors we shouldn’t view them as “auditions” but rather as an opportunity to act. I find that incredibly powerful. Auditioning can make an actor fall out of love with acting very easily. We work hard on our lines, we go in and expose ourselves, and more often than not we are turned down. We are told “you’re not the one”. After a while, that can weigh very heavily on you. You start to question are you pursuing the right career choice. Especially when you don’t know how you’re going to make rent. However, when you take the power back and treat auditioning as an opportunity to act and show your take on a character it frees you up the creative juices and takes some of the pressure off. Also in the interview he said that not every role is going to be your role. The one you get is the one that was meant for you. I couldn’t agree more. And what advice would you want to share with other up-and-coming actors? SHAUN: The advice I would give is to be the very best actor you can be and the very best person you can be. Get in an acting studio and really study the craft. Be a genuine person. Be kind. If you do those things your journey will be a lot easier. It’s hard to deny excellence. If you are an incredible actor people will take note. You might not get the role but you will leave an impression and that can lead to something great down the line. Being a good person is so important because no one wants to hang around a jerk for 8-12 hours everyday. Being an excellent person and an excellent actor is a sure fire way to start booking acting jobs. Also, when starting out, say yes to everything (unless it takes you off of your moral center). Take every opportunity to act. Collaborate. You never know who the next Steven Spielberg is. You have two films coming out next year: “Wilson” and “Heart, Baby”, what can you share about those projects? Who do you play and how does your character fit in the story? SHAUN: Wilson is based off of the graphic novel “Wilson” by Daniel Clowes. Wilson is played by the great Woody Harrelson and is a story about a smug, condescending, lonely man who is trying to turn over a new leaf and connect with his family. I have a cameo in the opening of them film that shows just how crazy Wilson is to complete strangers. “Heart Baby” is an incredible true story about a man named George in a Tennessee state prison that was an incredibly gifted boxer. He was so great that he was offered a chance to be exonerated and perform in the Olympics but turns it down. The reason will punch you in the gut for sure. I play the role of Bug, one of George’s closest childhood friends with big eyes and an even bigger heart. Bug is the comic relief but has an incredible emotional journey in which the audience will see him go from a boy in to a man. What has been some of your favorite things to do on screen for these projects? SHAUN: For “Heart Baby” I had to lose weight, learn a southern accent, and get in to the mindset of a prisoner. When I was approached to do the role, my first reaction was fear. That fear told me that I had to do it. It had to be conquered. Bug was a real “character role” in which I got to dive in and explore parts of myself that I hadn’t had the opportunity to explore in any other role. I loved the research that went in to bringing the character to life since it was a true story. Automatically the empathy was there and I had a duty to serve this incredible tale. What was something you take away from the experiences on “Wilson” and “Heart, Baby”? SHAUN: Both experiences gave me the confidence for the next job. Without “Heart Baby” there might not have been THE GREAT INDOORS for me. When I came off of both projects I had a sense of “Well, you did that and you did a great job and you can pay your rent for x amount of time.” Basically there wasn’t a lot of pressure to book the next one because I knew I could feed myself and keep a roof over my head. Knowing that took away any desperation to book the next audition. I wish that lack of desperation showed up earlier in my career, but everything happens for a reason. What’s next for you? Where is your passion taking you? SHAUN: Next I would like to do another indie film with a great story. I was trained in theater and Shakespeare, so I tend to lean towards great stories that make the audience reflect and spark some sort of change. It doesn’t necessarily have to be a drama but it does have to be unique and push everyone that is involved to create the best art possible. I love a challenge and I love the journey of film making. Finally, any teasers on what to look forward to this season in THE GREAT INDOORS? SHAUN: The show starts off with jokes about generational differences but it evolves in to a very quirky, warm, and heartfelt workplace comedy that everyone can enjoy. One of my favorite episodes is when the millennials are forced to camp and “rough it” in the wilderness. It was extremely hard to not break throughout shooting that entire episode. Extremely funny and extremely true. To see whether the two generations can find a common ground to communicate, be sure to tune in to the premiere of THE GREAT INDOORS on Thursday, October 27th at 8:30 p.m. on CBS — and keep watch for Shaun’s new films “Wilson” and “Heart, Baby” as they debut in 2017.